Welcome to visit jtfurnace dot com. Multi-billet Hot Log Shear Furnace is applied to many aluminum bars heating up half homogenization processing, the aluminum bar hot shearing, and apply to the use of matching extrusion machine. Advantages: 1. The equipment is mainly composed by the heating furnace body, enter bar shelf, retreat bar shelf, hot shear machine, electric control and so on.. 2. In the furnace, one time deposits many aluminum bars, the aluminum bar is long in furnace preheat interval, this heating way has certain homogenizing effect to the aluminum bar. 3. With the efficient production of stability, durability, ease of maintenance, comprehensive performance 4. The heating fuels: Fuel oil, producer gas, natural gas, liquid gas LPG, coal and other optional. 5. Prepares produces time: The fuel oil, the fuel gas with 2~4 hours, burns coal with 4~8 hours Detailed product specifications, please visit our website jtfurnace dot com. And send email to us jtfurnace at hotmail dot com. 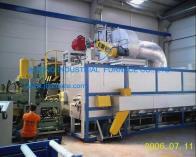 Our company is specialized exporter, manufacturer and supplier of China Multi-billet Hot Log Shear Furnace in china.